One of the biggest reasons for purchasing a Google Pixel or Nexus device is to receive timely software updates. This, for sure, has been the case ever since Lenovo took control of Motorola, the only company that had managed to beat Google to a new OS in the Nexus era. However, in the recent past, there have been flashes of what Motorola was able to achieve back then. Last year, LG beat Google to Android Nougat by unveiling the V20 ahead of the original Google Pixel and Pixel XL. This year, Sony did it by beating the Pixel 2 to Android Oreo thanks to an early launch of Xperia XZ1 and XZ1 Compact in August. One common thing about these two cases, however, is that they involve new phones and a new OS. But with the case of NVIDIA SHIELD, we are talking about a device that was unveiled in July 2014, which makes it more than 3 years old. For starters, NVIDIA has already updated the tablet to Android Nougat, which makes it the only other device from 2014 – apart from Google Nexus 6 – that received an OTA update to Nougat. 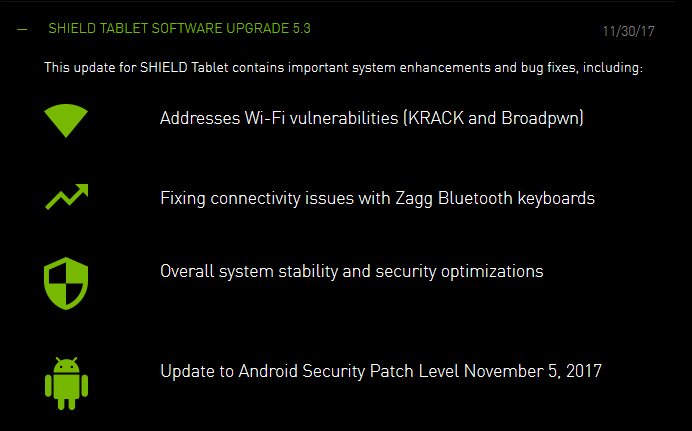 Just to show you how much serious it takes software updates’ matters, NVIDIA is also rolling out an update that brings a fix to the KRACK Wi-Fi vulnerability. Even though this security hole has not been actively exploited, quite a good number of OEMs have updated their devices with a fix. Surprisingly, Google hasn’t. While it’s easy to argue that Google hasn’t rolled out the fix because it doesn’t pose any immediate threat, the fact that KRACK is a known issue is enough for Google to roll out a fix for all Pixels and Nexuses, just like Samsung is already doing with the huge collection of phones it has, including the 2015 Galaxy S6 and Note 5. The update, which carries software version 5.3 that is based on Android 7.0 Nougat, also installs a new monthly security patch for the month of November. Although not the latest, it’s just amazing that a 2014 device is currently on a November 5, 2017 security patch level, even ahead of some carrier variants of the Galaxy Note 8 and a myriad of other phones. If you have had any connectivity issues when using Zagg Bluetooth keyboards, you also need to install this update ASAP because it carries the fix to the issue. NVIDIA also notes that the update brings the usual system stability and security optimizations.